Harris Ahmadzai — Todd Gurley: Since we aren’t clarifying exactly how many yards we need to achieve on this ‘one play’, I need a guy that is a threat to score from anywhere on the field — be it from midfield or the one-inch line. Gurley has the size and will to fight for extra yards, but also possesses home run ability to take it the distance. Other potential options I mulled over were Leonard Fournette (a two-legged freight train) and LeSean McCoy (one of the five shiftiest runners I’ve ever seen). 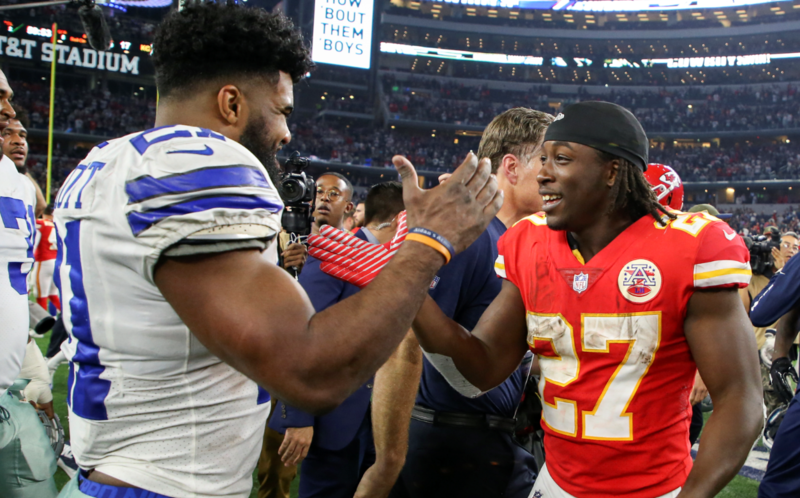 Dylan Fraychineaud — Kareem Hunt: Hunt may have slowed down at the end of his rookie season, but there is no denying his game-breaking ability. Playing alongside two of the biggest offensive threats in the NFL — Travis Kelce and Tyreek Hill — results in Hunt having more room to work with. Hunt averaged 4.9 yards per carry and proved to be a tough runner to take down. The NFL’s leading rusher also hauled in 53 passes last season. Hunt’s ability to break off a long run — three 50+ yard runs last season — and turn dump-off’s into big plays — took 10 receptions over 20 yards — make Hunt the most dangerous back on any given play. Jason Fray — Alvin Kamara: Kamara is the best option in this scenario. As a rookie, Kamara averaged 6.1 yards-per-carry and 10.2 yards-per-reception. This includes accumulating 13 total touchdowns and over 1,500 yards of total offense. With the ball in his hands, Kamara is always a threat to take the ball to the house. For a team in need of an explosive play, Kamara will shine. Very few backs currently possess his combination of pass-catching skills and elusiveness in the open field. Blake Hoffman — David Johnson: Remember him? He’s the guy who accounted for 2,118 yards and 20 touchdowns in 2016 before suffering a freak wrist injury last season. While all the hype is squarely focused on Todd Gurley, Le’Veon Bell and Ezekiel Elliott entering 2018, David Johnson remains the biggest home run threat among running backs. Whether he is taking a carry or a screen pass, Johnson’s elusiveness and breakaway speed makes him an easy choice for one play. Harris Ahmadzai — Le’Veon Bell: The most important thing an offense can have in a one-drive situation is the element of surprise. An offense that is versatile and unpredictable with their play calling will put the defense on their heels. No running back can do more things on a football field than Bell. He wants to be paid like a wide receiver, and he probably should be with his 312 career receptions. Defenses will have to respect Bell’s ability as both a runner and receiver, opening up multiple opportunities to attack the field. Dylan Fraychineaud — Le’Veon Bell: Bell is arguably the best back in the game today. His patience in the backfield is unmatched, while his ability to take his game to the outside puts him a step ahead of the rest of the league. Bell has the ability to score every time he touches the ball. Not only has the Steelers great rushed for 2,559 yards over two years, but he has added 160 receptions. The ultimate weapon, Bell is one of the few backs capable of being on the field for every down — and the one I would choose if I had one possession and needed a score. Jason Fray — Ezekiel Elliott: Elliott is a beast in the best sense of the term. Physical and dynamic, Elliott is masterful at exploiting creases in opposing defenses. There also might not be a more explosive runner when bolting into the second level. It makes Elliott perfect in a situation where his team needs to ice the game away with one last clock-chewing drive. The same can be said if the team is in desperate need of moving the chains. Elliott has proven to carry the heavy load time and time again. The former Ohio State star also appears to get stronger as the game goes on. This is an unwelcomed sight for fatigued defenses hoping to hold on during play in the fourth quarter. Blake Hoffman — Todd Gurley: The 2017 Offensive Player of the Year frequently showed his explosiveness on a drive-to-drive basis last season. Capable of moving the chains or rattling off chunk yardage as a rusher or receiver, Gurley is an impossible matchup for any defense. As a premier three-down back ready to run around, through or over defenders, Gurley is who I want in my backfield when my team needs a touchdown. Harris Ahmadzai — Ezekiel Elliott: There aren’t many true workhorses in the NFL anymore. Saquon Barkely has been billed as one, and Leonard Fournette is well on his way, but the amount of backs that can tote the ball upwards of 30+ times per game is dwindling. Elliott stands in a class of his own in terms of volume. The Dallas bell cow has already had 600+ touches in 25 games, and has the size, conditioning, and speed to wear out defenses over the course of 60 minutes. Dylan Fraychineaud — Ezekiel Elliott: Similar to Mr. Ahmadzai, this category came down to Elliott and Fournette. The latter has a running style more conducive to the NFL of yesteryear. He is a physical back who isn’t scared of contact, yet also possesses the ability to take any carry to the house. However, Elliott is the league’s premier workhorse. He has a staggering 564 carries in 25 games and is averaging 4.6 yards per carry. Elliott’s troubles are well-documented at this point, but his brute strength and ability to wear down a defense make him the clear choice. Jason Fray — Le’Veon Bell: Bell is the most complete back in the NFL. He runs with the patience of a Tibetan monk. This allows for the 6-foot-1 athlete to watch running lanes develop before bursting forward for positive yardage. Though Bell is considered a bigger back, his feet dance in the hole akin to a ballerina. Duly, his prolific nature as a pass-catcher makes him a highly versatile player. On any given day, Bell can gobble up 200 all-purpose yards (with multiple scores in the process). A team possessing Bell’s unique traits can be both complex and lethal on the offensive side of the ball. How many other All-Pro running backs can split out wide as a jumbo receiver? Blake Hoffman — Le’Veon Bell: Contract extension discussions have begun to cloud Le’Veon Bell’s greatness. A ‘down year’ in 2017 still included 400+ touches and 1,900 total yards, and at 26 years old, he isn’t at the age where one would expect regression. His unorthodox running style makes him difficult to game-plan for, and his ability to line up anywhere on the field is second to none. With one game on the line, I want Le’Veon touching the ball 30+ times to carry my team to victory. Harris Ahmadzai — Christian McCaffrey: The league has seen a surge of talented young backs over the past couple of years, all of which would be worthy candidates at this spot. However, Elliott’s off-the-field issues are concerning, Fournette doesn’t posseses elite top-end speed, and Alvin Kamara hasn’t yet proven he can be a full-time bell cow. McCaffrey grants me the most flexibility. He’s supremely talented, and comes from a strong family pedigree. If my team happens upon another great running back a few years into the five-year deal, then McCaffrey can seamlessly make the transition to wide-out. Dylan Fraychineaud — Todd Gurley: In the words of the great Mel Kiper — Todd, Todd, Todd! Gurley will be 24 entering this season and is coming off his best year. 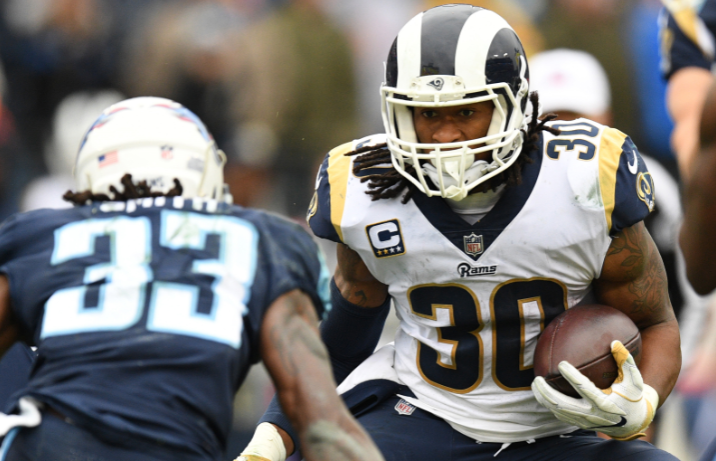 Gurley finished last season ranked second in DYAR (a stat that represents a running backs total value), fourth in DVOA (value per play), and trailed only Le’Veon Bell with 1,444 effective yards. Gurley is in the perfect situation to succeed, playing for one of the top coaches in the league, and alongside a promising quarterback. Gurley has improved as a pass catcher each of his three seasons, and is coming off a career-best 1,305 yards rushing. The Rams’ back should be elite for years to come. Jason Fray — Todd Gurley: Gurley has all the makings of one day becoming the best back in professional football. The Georgia product has elite quickness for a man standing 6-foot-1. His agility is further accentuated by considerable power. Gurley has the option of running around defenders off the edge, or running over them in-between the hashes. As he approaches his 24th birthday, Gurley has at least a handful of elite seasons remaining before experiencing any sort of major drop-off. Blake Hoffman — Ezekiel Elliott: There’s a good case to be made for plenty of running backs in this spot. Guys like Leonard Fournette, Saquon Barkley, Alvin Kamara, David Johnson and Le’Veon Bell all came to mind, but ultimately, this one was down to Gurley and Zeke for me. Both guys are only 23 years old and are entering the prime of their respective careers. While he isn’t as big of a threat in the passing game, I’ll take Zeke by the narrowest of margins. He is the best between the tackles runner in the game, and doesn’t have a torn ACL in his history like Gurley does.